In the last article we'd took a close look at Nimrod the mighty son of Cush. I'd touched on how Nimrod was a different type of breed, a different type of man, for we'd discovered that he wasn't content with being a ruler over just one kingdom. No, Nimrod was a conqueror at heart, and being a hunter of living things, was simply in his nature. And it didn't matter if he was hunting man or beast. And just like I'd stated in the last article, during Nimrod's reign, we find that he had established four different cities from within The Land of Shinar: Babel, Erech, Accad, and Calneh. We'd also learned that after Nimrod had settled in Assyria, we're told that he'd eventually built the capital's city of Nineveh; along with the cities of Rehoboth Ir, Calab and Resen. 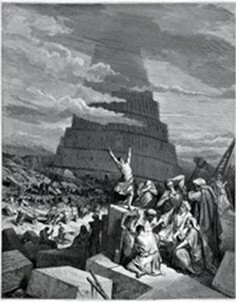 I'd also briefly mentioned the possibility, Nimrod was perhaps the mastermind behind the building of the infamous tower that was known as The Gateway to the Heavens, a.k.a: The Tower of Babel. Now let's use this article, to see if we can shed a little bit more light on this infamous event. Now like I'd stated earlier, there's strong evidence that supports the viewpoint, this project might have been planned, and orchestrated by Nimrod, who himself, was the founder of Babylon. I would also like to point out at this time, the name Babel means: The gate of God. I'm mentioning this, because later on, after God had judged humanity; when it came to their vain attempt, at trying to achieve some type historical elite status, by trying to construct some type of symbolism that represented what they perceived as divinity; the Lord changed the name, to mean: confusion. Now when it came to the bricks that the passage mentions. Keep in mind, because of the land's layout, Nimrod didn't have the rock quarries that were necessary for him, and his followers, to produce enough stones for a massive project such as this. Also know, there has been strong archeological evidence that points out, the walls of Babylon, had indeed, been made of brick. Now the main goal, when it came to the Tower of Babel; dealt with marking the place, in which a one world empire that Nimrod wanted to create, would be established and symbolized, for all the known world to see. Understand, when it came to this city and tower, the human race were going to build, was strictly fueled by their pride, vain-glory and defiance towards the One True God. Keep in mind, Nimrod and his followers had already turned their backs on the Lord. And it's because of their rebellious hearts, humanity decides to build their own gateway to the heavens, by constructing a massive tower monument. I mean after all, they must have thought: "Who needs God? We can be great all by our selves." And it's this type of attitude that Nimrod and his followers had; which leads me to believe, this massive building project, was simply being fueled by their prideful, and vain attempt, at trying to achieve some sort of historical elite status, all on their own. They also must have thought, this massive tower would've served as some type of symbol, and representation, of the type of power they felt they had finally achieved as a generation. Nimrod must have felt, the tower would have stood the test of time; therefore showing future generations, just how wise, powerful, and wealthy, they thought they were as a generation. And this is why I can also embrace the notion, Nimrod and his followers believed that all future generations, would take note of their great achievement, as they gazed upon this massive tower, and perhaps be in constant awe of what Nimrod and his generation had accomplished. First off, I believe that God is everywhere, all the time. I'm simply pointing this out, because it's presumed that this passage, seems to be pointing out, God had manifested His presence and power, in order to be displayed in that one particular place, during that one moment in time, for all that was there to be a witness to. Now it's presumed that this is referring to the Blessed Trinity. Now I believe the Blessed Trinity, deals with the Father, Son, and the Holy Ghost. Furthermore, the passage goes on to point out, God wanted to confuse the language of humanity, in order to create different culture divisions, from within its overall makeup. Being that it was at this moment, the Lord had acknowledge that, when humanity is completely united, they will be able to do anything, they can imagine and set their mind and hearts to. Even if their actions, were meant to go against God, and His overall plan for them. Now we've ended this article, by mentioning the problem with humanity being united, working as a global collective unit. Also know that this wouldn't be the first time, humanity had decided to work as a collective, being that the last time, they had tried this feat, we learned that God had to right the wrong, and He did this, by sending the Great Flood upon the surface of the earth. Be that as it may, in the next article, we'll touch on some of the specifics, when it comes the actual tower.